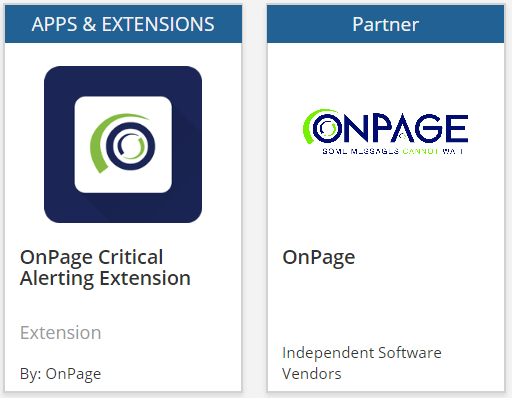 OnPage is the industry leading Mobile Critical Messaging and Incident Alert Management System. Built around the incident resolution lifecycle, the platform enables organizations to get the most out of their digital investments, ensuring that sensors and monitoring systems have a reliable means to escalate issues as alerts to the right person immediately. ThingWorx was purpose-built from the ground up for the Internet of Things. It contains the most complete set of integrated IoT-specific development tools and capabilities available, offering the industry’s deepest functional capabilities. Extensibility is a core aspect of the architecture and design of ThingWorx. Partners, third parties, and general ThingWorx users can easily add new functionalities to the system. Extensions can be in the form of Service (function/method) Libraries, Connector Templates, Widgets or through other methods. The OnPage extension allows IOT devices implemented in the manufacturing industry, production lines and facilities handling logistics to create improved workflows by connecting sensors to intelligent alerting technology. The OnPage integration with ThingWorx gives users a vast new set of alerting capabilities. While ThingWorx allows you to connect to anything and monitor everything, OnPage adds a critical alerting platform for when normal operating ranges are exceeded. Through an OnPage WebHooks integration, OnPage gives a voice to your monitoring system with audible, alert-until-read, priority messages. Now, ThingWorx users can receive an immediate and powerful alert when their applications run outside of accepted parameters and take appropriate actions to bring them back on track.